Prototyping - physical & digital. Creating a new sign for the ribot studio. 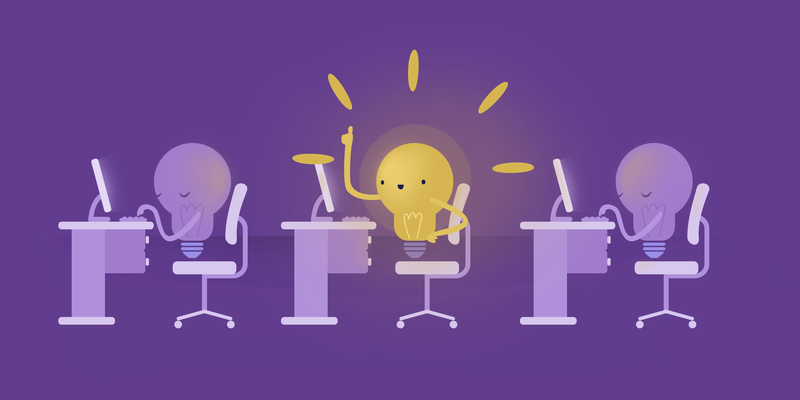 Here at the ribot studio, we love ideating, innovating and questioning. We’re constantly tinkering with new technology and researching new ideas. We do this not only because it’s fun, but because both people and technology are always changing, and it’s too risky not to. As technology advances, the competitive edge will be found by providing customers with experiences that entertain, educate and delight. Whilst we’re constantly researching and learning, we’ve just embarked on new innovation period we’re calling riBuild. Within this strand of focus within ribot, we’re innovating within several areas of new technology, along with our customers. We’re also working on a range of prototyping experiments. We’re not able to talk about all of them yet, but where we can we’ll post! For the very first part of this journey, we’ve been experimenting with building a sign for our studio. This is a ‘physical meets digital’ prototype. We’ve built a simple concept to hone our prototyping skills, show what can be done in a day, further develop our understanding of the Internet of Things, and play with different technology and concepts. So first up, a really simple problem. Not all of our lovely visitors are recognising when they have arrived at the ribot studio. We’ve got a very welcoming blue door, but no signage. Well, only a little bit - and we need something more ‘ribot’. 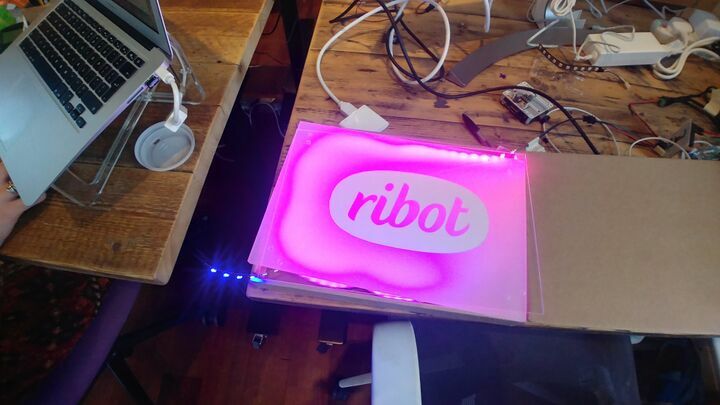 Rather than solve this with a simple sign, the team wanted to tackle this in a fun, playful way - an extension to ribot. So as part of riBuild, the team have experimented with several new tools and learned more about the physical prototyping process. 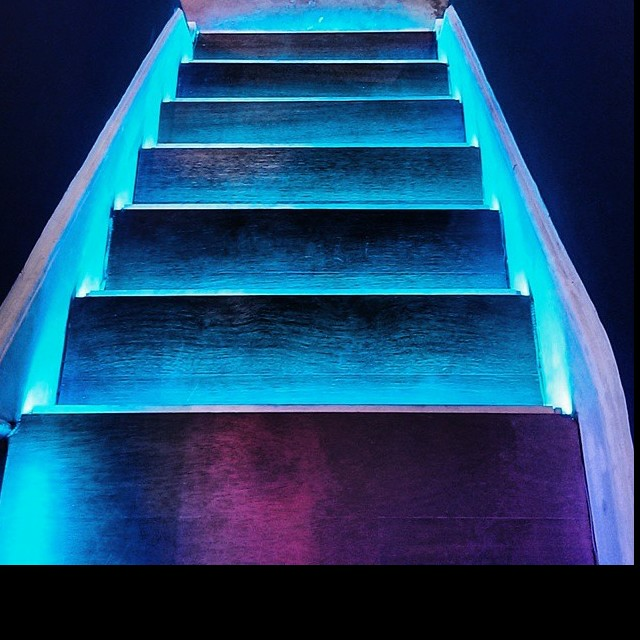 We’ve already got some disco stairs, so how about an adaptive and interactive disco sign to match? So first up, we took one small HDMI monitor and used a remote Chrome desktop login to test different colour backgrounds using different lights. We realised that this first screen wasn’t working, we didn’t require the resolution that it provided. As the final sign would require a 66” screen, this was costing up at £700 with a reflective display. The display couldn’t be seen during the day as the sun was shining directly on it. We decided that this approach would be overkill and inefficient for the task at hand. We were able to build the first version super quickly and iterate, but we realised that the sign needed to be more playful, less expensive and more aesthetically pleasing. We sketched a second iteration that would use LED lit laser cut acrylic, but when we ran the power calculations for this, we discovered that the electronics side of things was quickly becoming overcomplicated for the task at hand and the speed at which we wanted to iterate. Our new design needed to be simpler and more power efficient. So we quickly sketched a new, safer and simpler version. We added together a Raspberry Pi and some NeoPixel LEDs from Pimoroni, then connected it all up with some Python (a programming language). The awesome crew on the Pimoroni forums (where we got most of our IoT supplies from) gave quick and concise responses to our questions, allowing us to learn and move the prototype forward quickly. The excellent team at Barclays Eagle Labs were also a fantastic help with our prototyping and introduced us to their laser cutter. We used Adafruit’s tutorials to understand how the raspberry Pi can be used to light up NeoPixels (they have an amazing collection of content). We then created a Vector design file using Adobe Illustrator (later imported into Corel Draw) for the laser cutting & learnt that laser etching works based on lines per inch, the higher the number of lines the better the quality, but the slower the process. 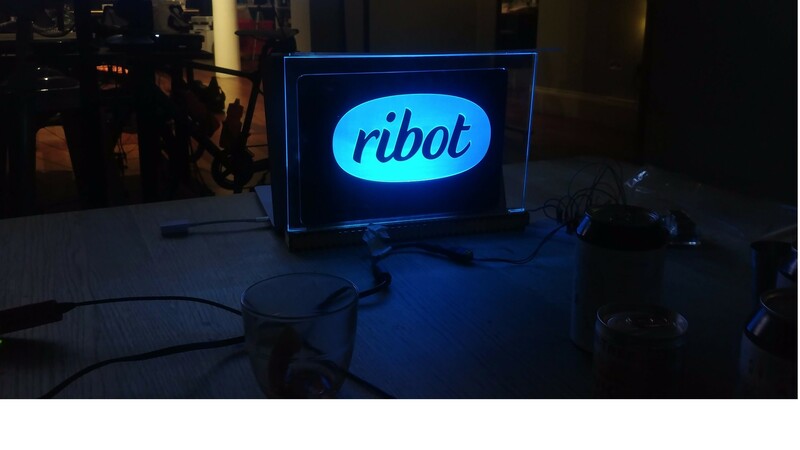 The sample ribot sign took 8 mins to etch and cut. The version we created was small and simple. The simple python script controlled the hue of the LEDs with a joystick. However, we found in the bright daylight we weren’t able to see the colours as luminous as we would wish to. Time to iterate the design further! The small size of the ‘mini’ prototype didn’t help in that it didn’t give a good enough indication of how bright the life-size sign will actually be. We felt like we’d learnt enough to start prototyping the life-size version of the sign. One problem though - the life-size version was too large for the local laser cutter. Most Makerspaces don’t have a laser cutter that can cut acrylic larger than 90cm in size. Onto iteration 4! We discovered a supplier that can cut *very* large pieces of acrylic. We also amended the design to include a black housing on the rear to reduce noise and help accentuate the etched LED lit areas of the sign to make the logo ‘pop’ even in bright daylight. The design has continued to change as we ensure it’s safe and power efficient. We have now sourced a Trotec laser cutter and created a vector artwork file with all the cutting and etching elements incorporated. The sign will announce our location in Seven Dials, making it easier for our visitors to recognise they have arrived at the correct location and hopefully making people smile. We only conduct these experiments in order to learn. So aside from creating a new sign for our studio, we’ve discovered a lot more about prototyping using different tools. We got much more familiar with the tools that helped us with the physical and digital prototype process including Raspberry Pi, NeoPixels, laser cutting and etching and Python programming. 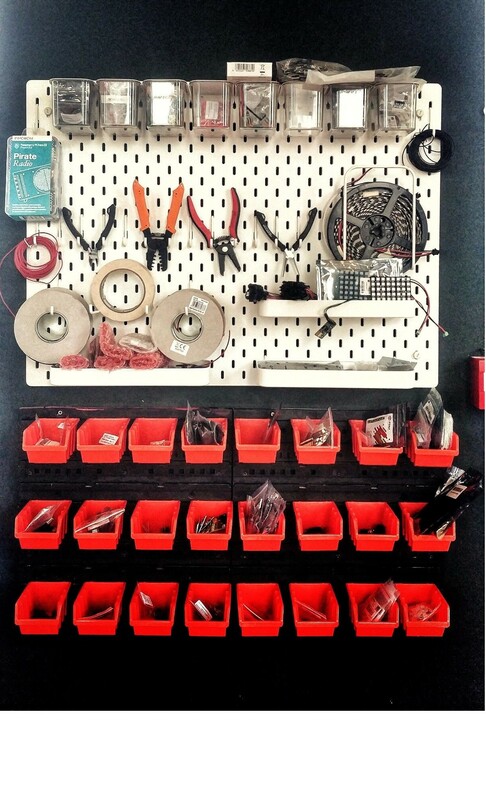 Hat tip to the team and the Makerspace at Barclays Eagle Labs who are a great resource for anyone looking to prototype and make stuff! They have been a fantastic help with assisting, exploring and teaching how to use equipment in their maker lab. As well as taking these skills and using them when prototyping with our clients, we’ll be doing more experiments with the sign. We’ll continue to collaborate with Barclays Eagle Labs and use the tools we have worked with within this experiment. As part of our riBuild strand of work within the studio, we’ve got several other experiments running concurrently. 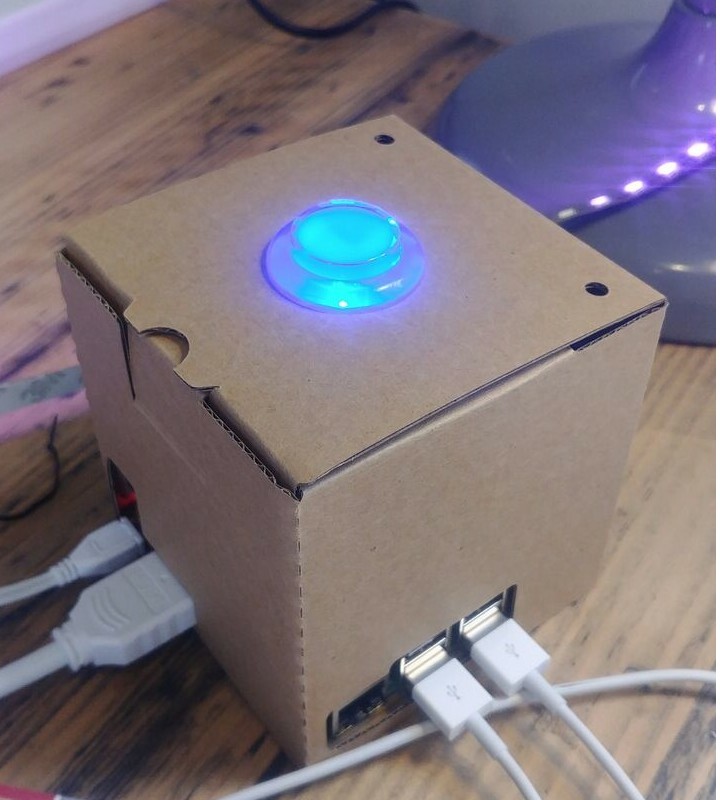 Expect more riBuild posts as we experiment with Google AIY Project Voice Kit, embark on a Hackfest with the Microsoft AI team and create further IoT and Mixed Reality prototypes. Watch this space!